Sharon Cordray submitted this photo and caption. This is a photo of three friends who all attended high school together at St. Stanislaus College in Bay St. Louis, Miss. 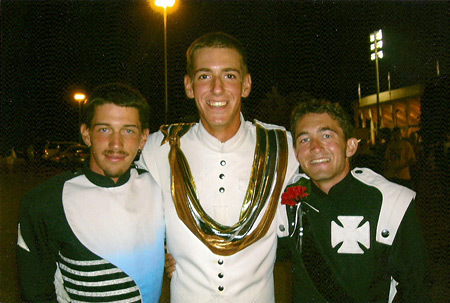 On the left is Shane Cordray, class of '06 (Teal Sound, Spirit, Blue Devils '09), Michael Roy '05 (Memphis Sound, Phantom Regiment), and Andrew Pretzello '05 (Memphis Sound, Crossmen). This was taken in the lot during the week of the 2008 World Championships in Bloomington, Ind. Both Michael and Andrew aged out this past summer.